Tennis Icon Serena Williams is 'Powered by Tempur-Pedic®' | Tempur Sealy International, Inc.
LEXINGTON, Ky., May 8, 2017 /PRNewswire/ -- Champion athlete. Fashion designer. Entrepreneur. Philanthropist. Serena Williams embodies POWER, both on and off the court. What is fueling her power? Ten years of sleep on a Tempur-Pedic® bed. Tempur-Pedic announced today that the brand is teaming up with the tennis icon to amplify its new "Tempur-Pedic Sleep Is Power™" campaign. The partnership will demonstrate the unique power of Tempur-Pedic sleep as Williams continues at the top of her game. The "Power" campaign will be supported by record levels of advertising throughout the high-demand summer selling season. "I require consistent, restful sleep in order to be at my best, and for the past 10 years, my Tempur-Pedic bed and pillows have delivered that," Williams said. "This is the only mattress that adapts to my body, relieving pressure points so I sleep deeply and wake up ready to perform on the court and conquer whatever the day might hold." 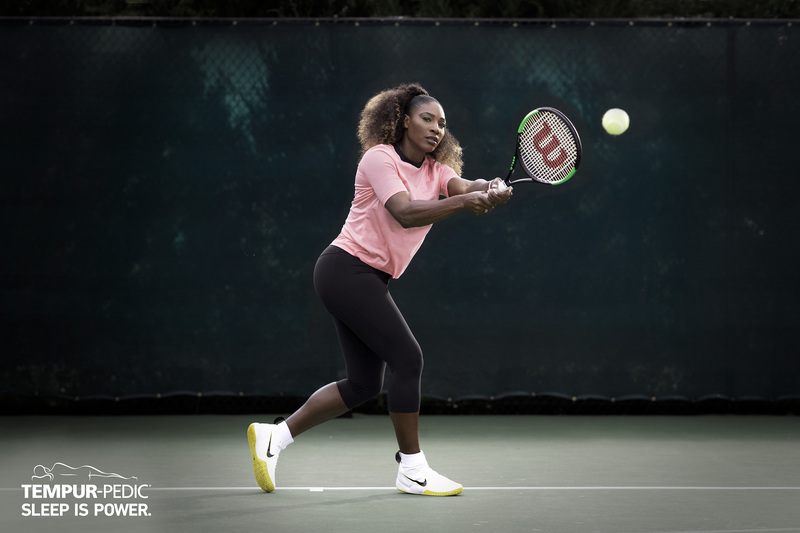 As the most dominant tennis player of all-time and a Tempur-Pedic owner for more than a decade, Williams recognizes that sleep is a critical component of her demanding training regimen and recovery efforts. 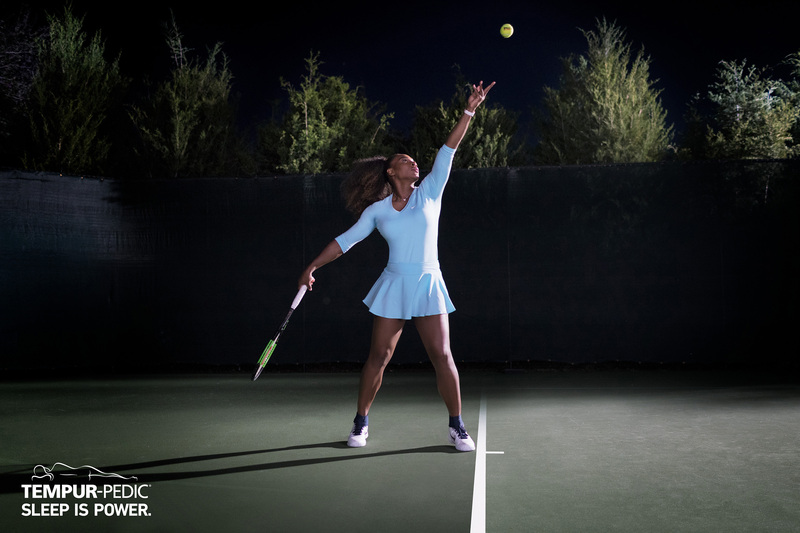 Tempur-Pedic's collaboration with Williams is part of an integrated marketing campaign that features the tennis great training on-court (showcasing her powerful 120 mph serve) and the superior pressure point relief she enjoys by powering up on her Tempur-Pedic at night. View the TV campaign spots here: Pyramid Test and Pressure. 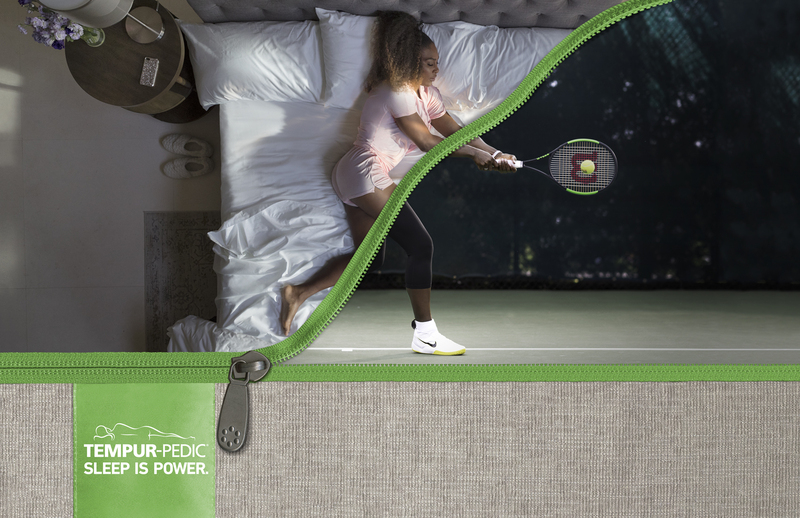 "Through our 'Power' campaign, which debuted in late February, consumers are able to see firsthand how current owners, including Serena Williams, perform at their best and optimize their personal growth by getting great sleep on a Tempur-Pedic," said Rick Anderson, Tempur Sealy Executive Vice President and President, North America. "As a longtime Tempur-Pedic owner and someone who lives our brand promise daily, we are proud that Serena is helping us tell our story." The "Tempur-Pedic Sleep Is Power" campaign features nine Tempur-Pedic owners who spend their days doing things such as instructing military freefall skydiving, snowboarding and training for duathlons. Afterward, they spend their nights sleeping on their Tempur-Pedic mattresses. The campaign illustrates that sleep on a Tempur-Pedic changes the way people feel and how they perform, and showcases the significant positive effects that Tempur-Pedic sleep has on their lives. "With the launch of this campaign, which is supported by a significant increase in national media, we are primed to see unprecedented demand for Tempur-Pedic," added Anderson. "Consumers, inspired by Williams and the remarkable stories from these owners will be able to walk in to one of our retailers feeling confident and prepared to buy Tempur-Pedic products." Beginning this month, Williams will be featured in television and digital advertising. The ads, which include the unique 'match cut' creative technique, will be supported through social media and PR efforts as well. "Since the age of three, I've spent countless hours on the court," Williams said. "Over the years, my routine off the court - eating well, staying positive and getting quality sleep - has paid dividends. Now as I start a new journey into motherhood, sleep will continue be a top priority for my family. I look forward to what lies ahead, including in my tennis career - all while being powered by Tempur-Pedic." For more information about Tempur-Pedic, visit www.TempurPedic.com. Tempur Sealy International, Inc. (NYSE: TPX) develops, manufactures and markets mattresses, foundations, pillows and other products. The Company's brand portfolio includes many highly recognized brands in the industry, including Tempur®, Tempur-Pedic®, Sealy® featuring Posturepedic® Technology, and Stearns & Foster®. World headquarters for Tempur Sealy International is in Lexington, KY. For more information, visit www.tempursealy.com or call 800-805-3635.